A moka pot is a stove-top or electric coffee maker that produces coffee by passing boiling water pressurized by steam through ground coffee. It was patented for the first time in Italy in 1933! 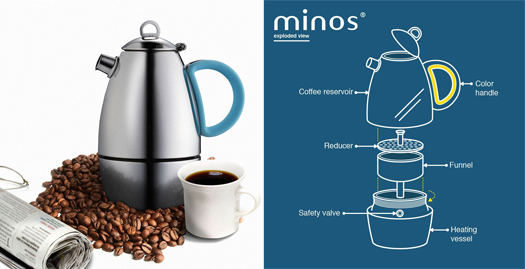 This Mimo Moka Pot Expresso Maker is a stove-top model. It is cute yet durable. So easy to both use and clean. Oma found the resultant brew from this expresso maker to have an increased extraction of flavors from the grounds versus filter coffee . . . . resulting in a stronger brew than that obtained by drip brewing – Yummy. Pour cold water into bottom chamber. Grind the fresh coffee beans. Add grounds to heating vessel. Press grounds slightly with tamper plate. Place moka pot onto the heat source. The flame (if using stove) should not exceed the edge of bottom chamber. Keep the cover open when brewing coffee. Turn off heat source when coffee stops and cream comes out. Clean moka pot after use. Place the parts upside down to ensure there is no water hidden inside. To clean, just take it apart and put in the dishwasher. 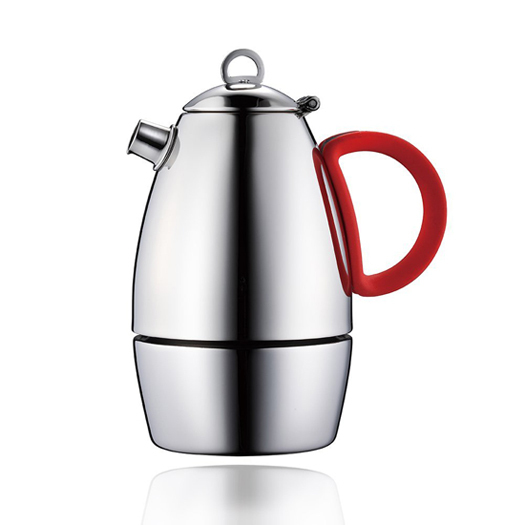 Tip: Before first use of the moka pot, clean the whole pot with soft dish towel and dishwashing liquid. Oma loves that it comes with two extra handles. If you’re a true coffee lover and are looking for a truly authentic, romantic and delicious cup of coffee, this will be the best thing you’ll read about today. 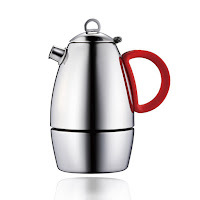 Brewing coffee with a Moka Pot, designed and first released in 1933, is still considered the world’s most authentic way to brew a strong, delicious cup of coffee. Today’s Moka Pots still have the same classic look to it, but we’re proud to tell you that we’ve practically “upgraded” the way people brew coffee from Moka Pots.